Spent a few hours over this weekend inking sound effects on page 2, and was quite happy with how they turned out. The uzi “ratatat-tat” has come a long way since SPY GUY: Bootleg. On the last panel, I took the advice of Sean Robinson over at the TCJ message board and went with an onomatopoeia sound effect as opposed to the more literal “snap” I originally had in there. 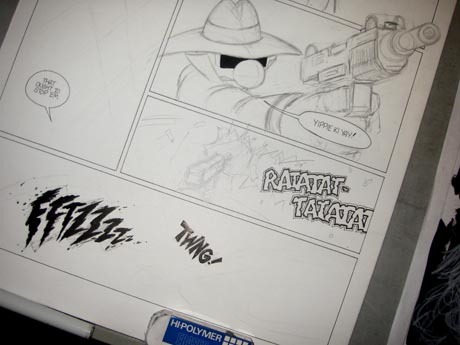 I’ll be doing the onomatopoeia sound effects on Page 3 as well. Speaking of Page 3, I spent some time locking down the roughs for that one this weekend too. Hope to transfer the pencils onto illustration board this week. This page will pose some inking challenges. Should be fun. Breaking News: Ultraist Studios is proud to announce the team up with Haven Distributors to bring you SPY GUY (as well as all the one-shot back issues). Stay tuned for more information. Update: To order SPY GUY through Haven Distributors, simply go to havendistro.com and you can browse the online catalog by using the ID: guest + Password: guest. Retailers can place an order by calling 1-877-HAVEN-50 (1-877-428-3650) or faxing 866-561-6280 or filing out the contact form here.